A renowned Scottish playwright finds an unlikely muse — the U-M Health System. Rob Drummond is a Scottish playwright known for taking risks. In 2014, he performed Bullet Catch at the Arthur Miller Theatre in Ann Arbor as part of the University Musical Society's, or UMS, fall season. Drummond played the role of a magician undertaking the trick by “catching” a bullet between the teeth. Per his usual methodology, Drummond immersed himself in the craft for months, learning how to masterfully execute illusions and sleight-of-hand, understanding the nuances that make magicians and their artistry so mesmerizing. While Bullet Catch was playing in Ann Arbor, Drummond spoke to a group of medical students, residents and doctors in the Medical Arts Program after a showing. The group, which connects the humanities to medicine and medical education, inspired Drummond and got him thinking about the roles doctors play in people's lives. He decided to write a play about it. 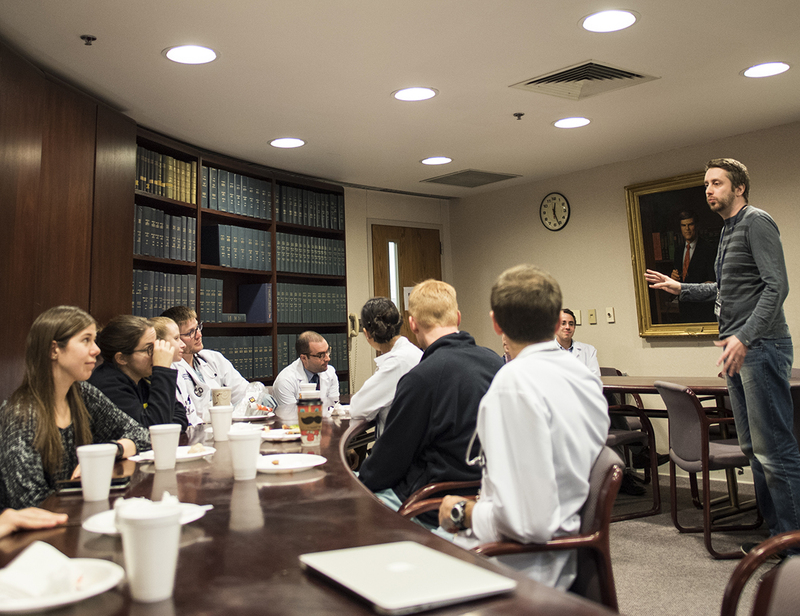 Drummond was so transformed by the interaction that he decided to return to U-M for an extended educational residency through the UMS, which works closely with the Medical Arts Program. He contacted Joel Howell, M.D., Ph.D., the Victor Vaughan Professor of the History of Medicine; professor of internal medicine; of health management and policy; of history, science and the arts; and co-founder of the program, to help him plan and coordinate the stay. For two weeks, Drummond shadowed residents on rounds, interviewed medical professionals and conducted workshops on improvisation for both art and medical students. Drummond soon realized that drama students and medical students are strikingly similar. “In both cases, there is a desire to do something that means something to the world, to connect with actual human beings … and to try in some way to fix the problems that come with being mortal,” Drummond says. Those involved in the Medical Arts Program were likewise captivated. Much of what the program emphasizes is understanding the humanity behind medicine — an important concept that is sometimes buried beneath the complex layers involved in healing and health care — and the importance of addressing a patient as a person and not just an illness. Drummond's workshops allowed the students and residents to approach the difficult concepts of medicine, like death and dying, head-on in creative and unexpected ways. Much of what Drummond was focusing on during his residency was how medical students approach difficult, complex situations — in particular, how to break “bad news” to patients. He wanted to understand the processes students employ to keep improving and learning despite the difficulties they face every day, and how those processes play out in their personal lives. In a few years, the interviews Drummond conducted with students, residents and medical professionals will surface — verbatim, he believes — in a play that will likely be performed at the Royal Court Theatre in London. It will be a profound conclusion that reflects the creativity and insight of U-M Medical School students and faculty alike. Drummond, for one, has gained immense respect for those who dedicate their lives to helping and healing others. To learn more about the Medical Arts Program at the University of Michigan Medical School, please refer to our feature story, published in summer 2015.